Happy Birthday Buffalo Wings! March 6 is coined as "Chicken Wing Day" by the State of New York, commemorating the first ever chicken wings served on March 6, 1964. I am always an avid fan of buffalo wings. Needless to say, I regularly visit Buffalo Wild Wings every Tuesdays for their 50 cents wings while I was still living in Minneapolis (another favorite of mine was Rudolph's). Ever since I moved to Singapore, I am always craving for that perfect buffalo wings. Needless to say, finding one is like finding a needle in the haystack, which explains why I never even tried - until last week, when my good friend and an avid buffalo wings lover himself suggested to celebrate the birthday of buffalo wings in Chili's nearby. That was when I started googling and discovered several places that sells buffalo wings - in Singapore. We opted to go for Buckarro BBQ and Grill at Bukit Panjang as it was the closest restaurant to where we live (the others are all in the East). 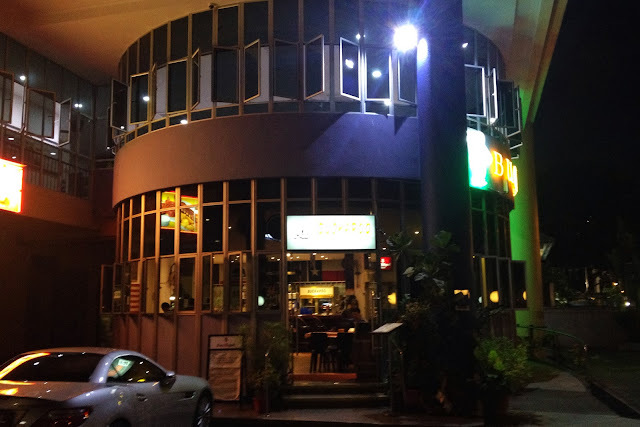 The restaurant is located in a hidden corner, and obviously very easy to miss for passerby. At least not the place where people will spontaneously stopover when they pass by - sad I know. Upon entering the restaurant, I got that rustic feel just like when I was entering a neighborhood eatery in a deserted place in the USA - like the only restaurant they have in a small town, that communal and country feel. 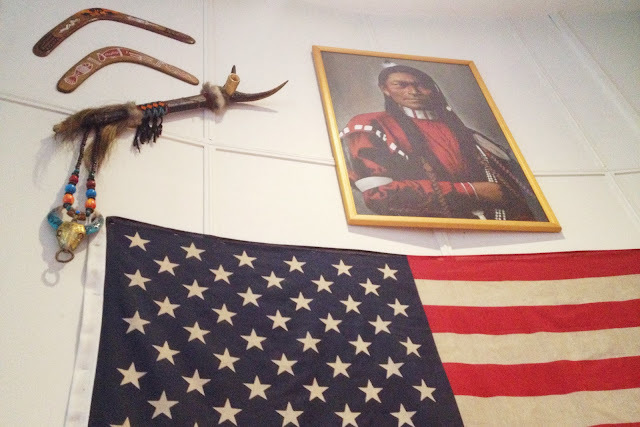 There were various nicely placed decorations - from Native American ornaments, car plates, state flags, Southern and cowboy trinkets, to Aboriginal boomerang (yes). We were approached by our waiter, who was really nice to explain the different hotness level of the wings they offer. There are in total 10 levels, and wings are sold per half dozen or per full dozen (note that 1 wing consists of both the wingette and the drumette). Level 1 is the "Combustion Wings" ($17.5/half, $26.80/full), Level 2 the "Volcano" ($18.80/half, $27.80/full), and Level 3 the "Insanity" ($19.80/half, $28.80/full). Additional level comes at $1.50 per level per half dozen. Each portion is served with carrot and celery. Both of us started with half dozen of Level 3 the "Insanity", which to our taste bud was NOT hot / spicy at all. There was just a tinge of hot that was very subtle. Then, we ordered half dozen of Level 7 (our waiter commented that she started feeling the heat at level 7, so we dared). Level 7 was indeed the heat bomb to your lips and tongue. I managed to finish the first wing nicely, but as I was munching on my second wing, I just felt that the heat and the acid from the buffalo sauce was too much for me. I believe the perfect level to my liking will be around Level 5. The chicken wings were fried to perfection. The skin was crispy, yet the meat was juicy and tender. The buffalo sauce was considerably good - although not the best I've ever tasted, could be the best in Singapore. It was slightly different from the traditional buffalo sauce. You could taste the acid and the heat, but you could also find more spice and herbs in the sauce as to the traditional version. Besides the wings, we shared the Onion Rings ($9.80/regular), which was the "must try" dish if you come to Buckaroo. The presentation of this dish was clever. 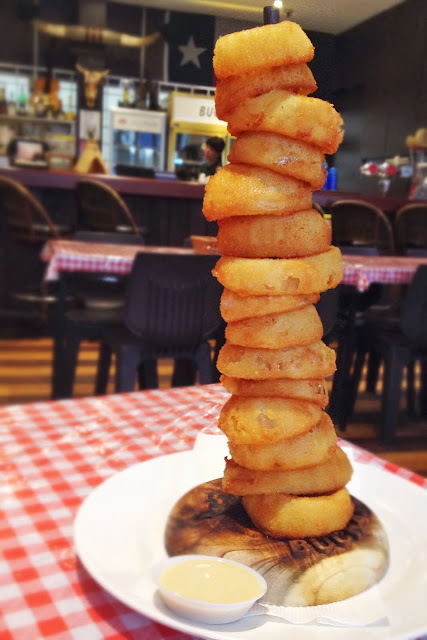 All the perfectly fried golden brown rings were stacked on a tower. To me, the rings from Buckaroo can be the nicest rings I have tasted ever (no kidding). When you bite into the rings, the onion immediately disintegrate leaving a clean bite, which to me is the number one criteria of a perfectly fried onion ring. Needless to say, the batter was delicious too. Besides all the good food, most importantly you could also enjoy one of the best hospitality you could get in a local restaurant. 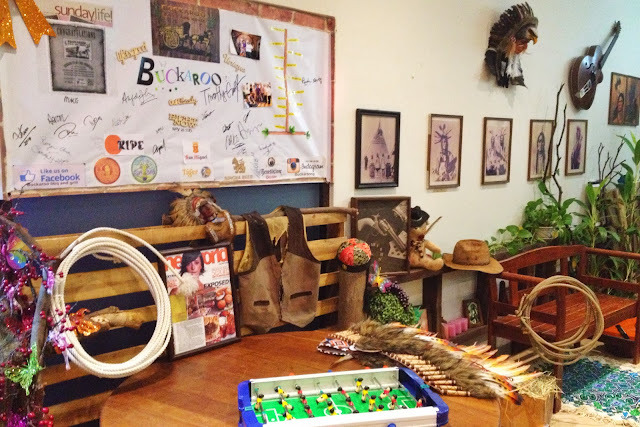 I would say dining at Buckaroo transports you to dining at a rustic countryside restaurant in the USA. Stop hesitating, all you have to do now is order some beer, clean your hands, and dig in! 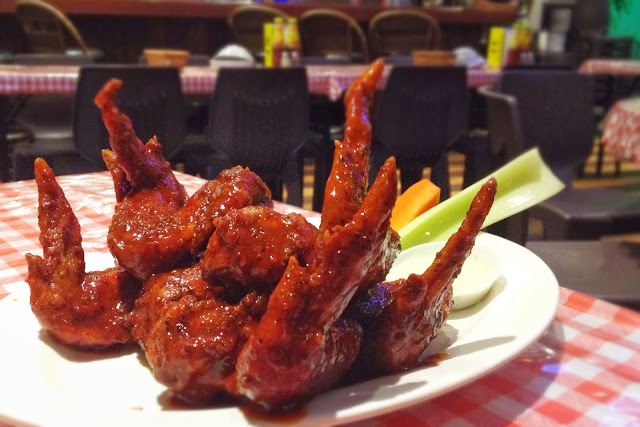 Real buffalo wings are eaten using your hands. 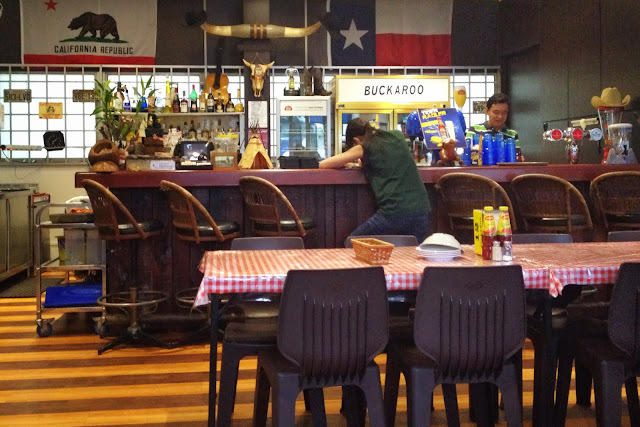 For all buffalo wings lover, (or BBQ lovers as they sell all sorts of BBQ), Buckaroo is a must visit.